HERAT, Afghanistan, November 26, 2010 (ENS) – Rahimullah stood in his cornflower field, killing field mice one by one as they were driven from their holes by a rush of irrigation water. Rahimullah’s frustration came from the awareness that he is fighting a losing battle against the mice and locusts which are destroying his crops. He has tried spraying chemicals, but to little effect. The real cure is missing – the insectivore bird species which attacked the locusts in flocks, and the birds of prey which kept mouse numbers down. These are disappearing day by day, he said, killed by hunters or caught by trappers who sell them to the burgeoning trade in live birds. Agriculture officials in Herat province confirm that the hunting and smuggling of birds have contributed to an increase in attacks by locusts and other pests, causing widespread crop destruction. The alternative – chemical pesticides – is both costly and damaging to the environment, they say. Abdul Aziz Saghri, head of natural resources at the provincial agriculture department, blames the lack of human and technical resources, and a degree of negligence on the part of officials. Others note that poaching has added to the pressure on wildlife species caused by deforestation in Herat, as in other parts of Afghanistan. There are no accurate statistics for wildlife numbers in Herat province, although officials say they are planning to conduct a survey. But they say it is already clear that a dozen bird species are in danger. 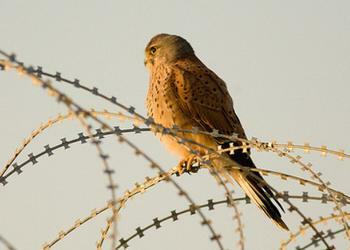 Hunting bans have proved difficult to enforce in Afghanistan’s fairly lawless environment. As well as birds of prey, from the smaller hawks up to eagles, the live trappers also do a lively trade in mynas, which belong to the starling family. Environmental protection officers in Herat province say more than 10,000 myna chicks have been smuggled to Iran in recent times, so that this once ubiquitous bird has become rare. Abdul Qayum Khan, head of the environmental protection agency, said that many people around Herat city are making a living from gathering myna chicks from nests. “The birds are smuggled to Iran in large numbers, in so that they now occur very rarely not only in Herat but in the west [of Afghanistan] generally,” he said. Mir Ahmad, 26, from the village of Nawin, is one of the many culprits. He goes around to the villages buying up mynas that people have caught at US$.50 a bird. He then takes them to Herat where he sells them for US$5.50. Once exported to Iran, they will each fetch up to US$40. The myna is a popular pet because of its amazing ability to mimic the human voice. But that does not explain why such massive numbers are being traded. Afghan agriculture officials say the birds also have a commercial value in Iran, where they are used to clear farmland of pests cheaply and effectively. Ghulam Sakhi, a 50-year old farmer from Qarauzak in Herat’s Anjil district, regrets the passing of the mynas. Environmental official Abdul Qayum Khan said Afghanistan’s frontier police are not doing enough to curb smuggling. “Whenever we identify someone as a bird smuggler, the police argue that they can’t arrest someone just for catching a few birds. This has become the biggest problem facing the environmental protection agency,” he said. Nikzad said the regional environmental protection agency has not approached police for help, and has not informed them of any bird smugglers. If asked, the police would of course take action, he said. A different message came from Aminullah Azad, deputy chief of the frontier police in the area. He said his officers are not treating bird exports as smuggling and are not focusing on the issue because they have received no instructions to do so. “When such an order is issued to us, we will stop any kind of bird from being taken out of the country,” he added. Hossein Mir Sikandari of the Iranian consulate in Herat said that his government takes a dim view of smuggling and would take action if it uncovered any cases. Any illicit transfers of wildlife involved Afghanis or Iranians operating on their own and there was no state involvement, he added. 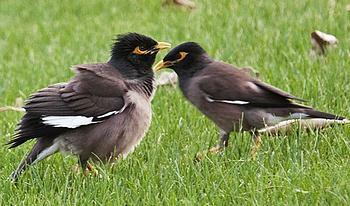 Sikandari argued that there is little reason for Iranians to import mynas. They are found in large numbers in places like the capital Tehran and Bandar Abbas in the south. The principal market for Afghan birds of prey appears to be the Gulf Arab states, where falconry is prestigious. Best of all are large raptors, the eagles used for hunting and as trophy pets. But Jamal said they are becoming increasingly difficult to get hold of; he had not been able to find an eagle to sell on in the last two years. “Their price starts at US$1,000 dollars and can reach US$100,000 dollars,” he said.